At the end of last year, I reviewed the Pinkus Jubilate Dark Lager, and now it's time to look at another offering from the world's oldest organic brewery: the Pinkus Münster Alt. Sampling this delicious German brew was of course a great treat, and I have to depart from my usual order of beer description and begin with the aroma, which was a gratifying, strong, sweet smell of German malts. I could smell it from a foot away or so, as I poured the beer! My mouth began watering before I even had a chance to take note of its attractive golden-yellow appearance. This beer seems a bit pale for an alt, perhaps, and sports a nice white head that leaves behind some good lacing around the edges of the glass. Along with the powerful malty aroma were fragrant notes of fruit and yeast. Overall, the smell and appearance make this a very inviting brew, and their promise of beery enjoyment was no empty one. This beer has a very nice mouth feel, and started off with fruity flavors of citrus and hints of banana, accompanied by a pleasant tartness and a rounded, medium-bodied maltiness. The hops were difficult to detect. This beer is incredibly drinkable, and if one has the benefit of living somewhere nearer the brewery than I do, I'd suggest stocking up on it. Overall this beer was nearly as magnificent as the Dark Lager. I'm going to also give this lovely beer four stars, because it deserves them. Ah, gueuze! The good old Brussels champagne--a strange beast made by mixing young and old lambics in the bottle for a secondary fermentation. This, my friends, is an unflavored, unfiltered lambic, and sampling one is often a rather interesting experience. A lambic, for those who are unaware of this style, is a spontaneously fermented beer, exposed to the wild yeasts, bacteria, and other airborn flora and fauna of the brewery. As I've mentioned in the past, I am not always fond of sour flavors, though this is something I've been trying to remedy through repeated, traumatic exposure. Hence I jumped at the opportunity to taste the St Louis Gueuze Fond Tradition from Von Honsebrouck. Like many gueuze producers, St Louis is actually a blender of lambics brewed by other breweries, and I think they do a pretty fair job. The Fond Tradition pours a cloudy, transluscent gold with a thin head made up of large bubbles. Tiny flakes can be seen swimming in the beer. My guess is they're flakes of yeast, but who knows? The olfactory experience of a gueuze can be a bit off-putting. This one didn't have as much of the old cheese smell I've associated with this style in the past, but had plenty of sour apple, sour yeast, and a sort of meaty tartness. The taste reminds me of apple cider, though the apple flavors do not come out on the tongue as much as they do in the nose. There's a sparkly effervescence to the beer and a kombucha-like funk to it. It's still rather drinkable, and I suspect it would go quite nicely with a strong meat dish or some pungent cheeses. I'm not familiar enough with this style to rate this beer, I don't think. But I'd love to hear your experiences with gueuze. What brand did you try? How was it? What dishes would you recommend it be consumed with? Let us know! I've had the pleasure of tasting a number of really remarkable beers lately. Among them is Dogfish Head Chicory Stout, a seasonal beer from that strange brewery in Delaware that we all love so much. 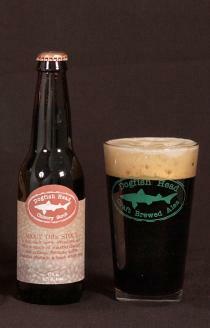 The bottle promises a hearty stout brewed with chicory and Mexican coffee under a "bone-white head". It lived up to almost all of these promises. When poured, this is a black beer through which little or no light can seep. The head, instead of being bone-white, is tan, thick, and healthy, with nice retention. On the nose, dark roasted notes of coffee and chicory are certainly present. I haven't had chicory in a very long time, so it's difficult for me to remember exactly what it smells like, but this beer definitely stirred some distant memories. This beer is a pleasure to drink. It has a spritzy effervescence that one might find surprising in a stout. Its strong coffee and bitter chocolate flavor is held up by a roasted sweetness and stout deliciousness. At 5.2% ABV, this is a beer that one can savor long into the cold Winter night, where I am certain it would be a most welcome companion. This beer earns four stars for being a rather outstanding and interesting stout.